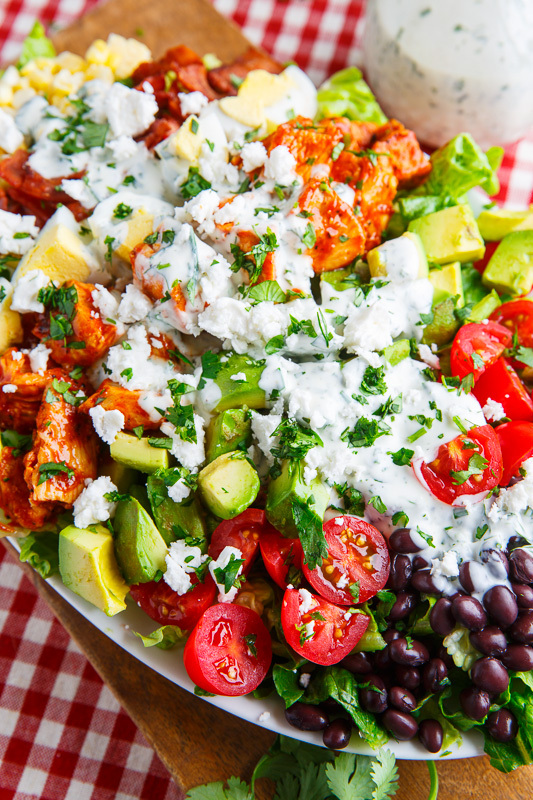 A southwestern style COBB salad with BBQ chicken and a creamy cilantro and lime ranch dressing. It’s time for another salad and boy do I have a tasty one for you, a BBQ chicken COBB salad with cilantro lime ranch dressing! 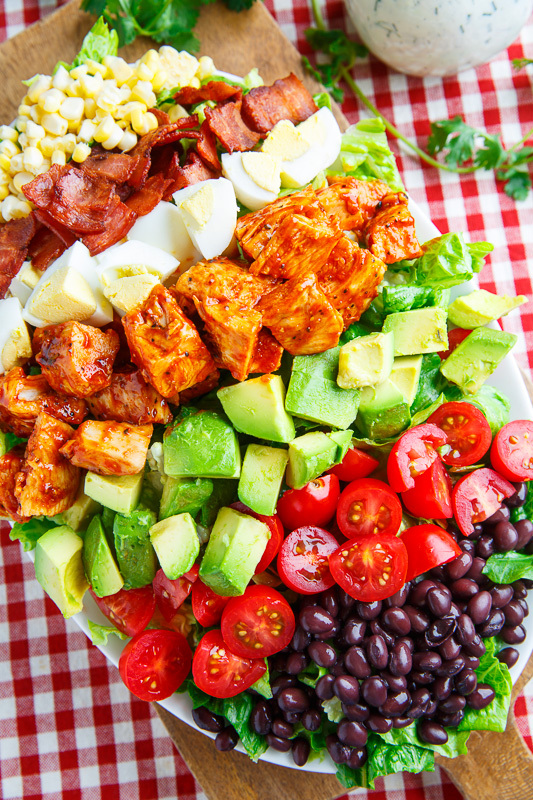 This salad is a southwestern twist on the classic COBB salad which uses BBQ chicken instead of plain chicken, adds corn and black beans to the regular lineup of tomato, bacon, egg and avocado, replaces the blue cheese with feta and the red wine vinaigrette with a tasty cilantro lime ranch dressing! This is definitely a salad that eats like a meal and given that it takes less than 30 minutes to make, it’s perfect for light summer dinners! If it’s a nice day head outside and grill the chicken and corn and enjoy the salad under the sunny blue sky! …um, are you still reading this? Hop to it! This salad is just screaming to be made right now! This salad is just loaded with tasty ingredients! Add plenty of cilantro lime ranch dressing! Cook the bacon in a pan until crispy, about 10 minutes, before setting aside on paper towels to dream. Season the chicken with salt and pepper to taste and grill or pan fry it over medium-high heat until cooked through and lightly golden brown, about 4-6 minutes per side, before setting aside to cool, slicing and mixing in the BBQ sauce. Assemble the salad and enjoy! Option: Use a different dressing like ranch or a creamy avocado dressing (aka guacamole dressing), cilantro lime vinaigrette, jalapeno ranch dressing, jalapeno popper dressing, etc. This is summer on a platter!! This is definitely the perfect summer salad to accompany any bbq!! Oh goodness- so delicious! And what a great way to use leftover BBQ chicken! I love an awesome twist on classic… and you KILLED it with this salad. I'm dying over that chicken – so moist and saucy and down right mouth watering!! Pinned! Healthy and colorful! Love this! This immediately went on my grocery list for tomorrow's dinner. It's 102 degrees here and this looks so refreshing! Thank you for your recipes! 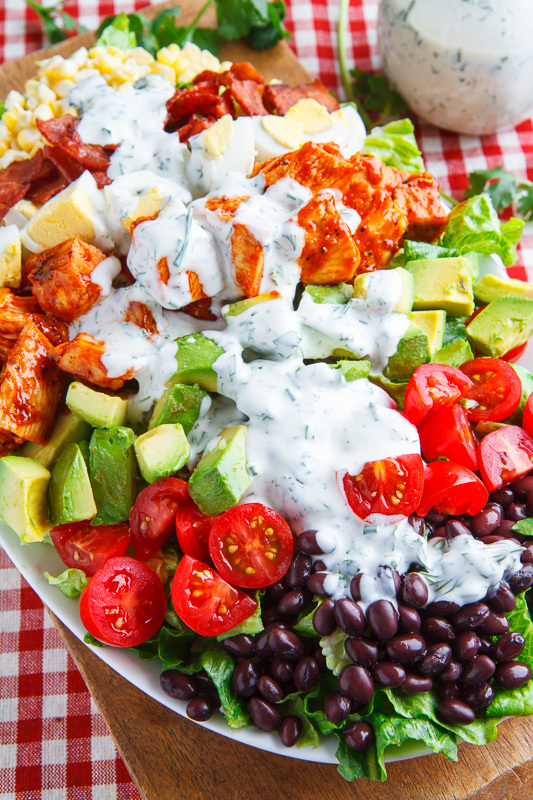 I love the idea of cilantro dressing with BBQ chicken in this cobb salad. 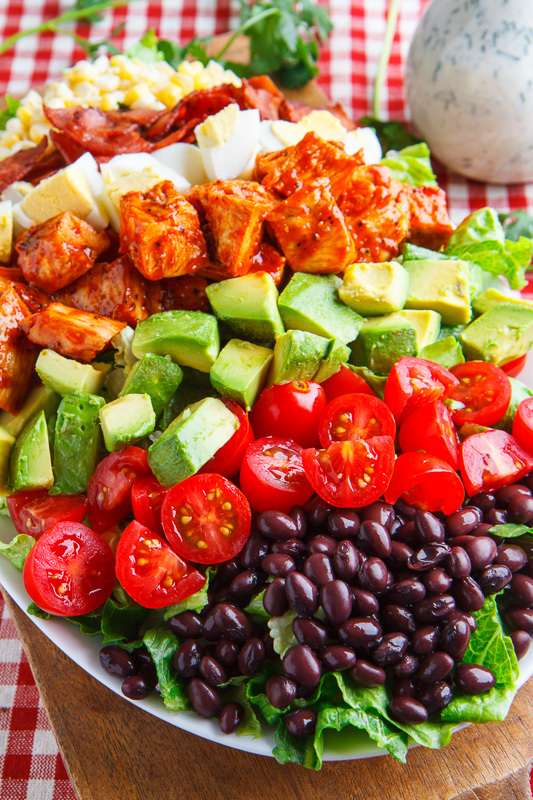 I'm always up for a fresh twist on Cobb salad and this looks just perfect!